A chalazion is an eyelid cyst caused by blockage of one or more of the glands that release oil at the base of the eyelashes (the Meibomian glands). This oil is an important part of our tears. The blocked, enlarging gland and the surrounding area of skin and eyelid becomes inflamed, tender and swollen. The red, swollen lid is not normally infected and settles after a week or two leaving a painless lump. 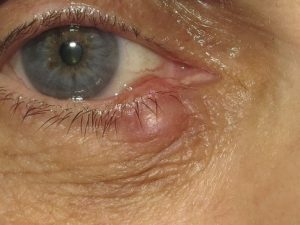 However occasionally the chalazion can get infected causing the surrounding area to become much more red, tender, warm and swollen. The chalazion should be massaged with a hot compress (a flannel, gauze or make-up remover pad soaked in warm water) twice daily. This treatment is frequently effective although may need to be continued for several weeks or even months. Antibiotics (usually oral) are prescribed if the chalazion could be infected. There is no evidence that antibiotics make any difference for non-infected chalazions. If you suffer from frequent chalazions, treatment for blepharitis (meibomian gland) disease should be considered. This is discussed in another information leaflet. If conservative treatment is ineffective the chalazion can be treated surgically. The area is frozen with local anaesthetic. The chalazion is incised, usually from the inner surface of the eyelid and then cleared out (curetted). Occasionally we also inject a steroid into the eyelid, which can help reduce the risk of recurrence in people who suffer from multiple chalazions. 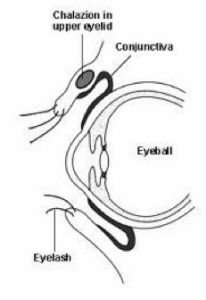 Infection: This is usually felt as an increasingly painful, red, inflamed eyelid that sometimes has pus or discharge coming from it, a few days after surgery. This is likely to require antibiotics and may need surgical drainage of the infected area. Bleeding: Bleeding should settle within a day or so but if it continues or is increasing, you may need further treatment. Continued bleeding is more common if you take blood thinners or have a blood clotting disorder. Recurrence: Chalazions can recur or new ones form in the same place. There is no clear data on the frequency of this happening, but people generally suggest this occurs in around 3-10% of cases. Lid notching: The incision of the cyst can rarely cause a slight deformity of the eyelid margin, which is called lid notching. This will almost always settle without intervention but on the rare occasion that it doesn’t, it can be surgically corrected. Triamcinolone injection: (if used) can very occasionally cause loss of pigment of the eyelid (more noticeable in darker skinned people) and can occasionally cause a rise in eye pressure. At the end of the operation antibiotic ointment or drops will be put in the eye and an eye pad is usually put on. You will be given the antibiotic ointment or drops to be used at home, usually two times a day for three to five days. After the operation you can take the eye pad off after two hours, although some people prefer to leave it on until the next morning as the eyelid may still bleed a little. You may find some blood and discharge in and around your eye. This is quite normal and can be removed by bathing the lids gently with cooled boiled water. The anaesthetic injection usually wears off an hour or two after the surgery. At this time the eyelid or eye can feel quite painful. You may have continued discomfort for a day or so. You can take paracetamol or ibuprofen tablets. The eyelid may look bruised and swollen for a few days and sometimes as long as 10 days after the operation. This will settle. The vision may be slightly blurred for a few days after surgery, but if it is very blurred or you cannot blink away the bleeding, please contact me or the clinic. You should not wear contact lenses until the eye feels normal again. You should be able to do most normal activities the next day and return to work, school or studying within a few days after surgery or sooner. It would be prudent to avoid swimming and any strenuous activities for 5-7 days.